ISBN 9790006453610. 9x12 inches. Key: A major. 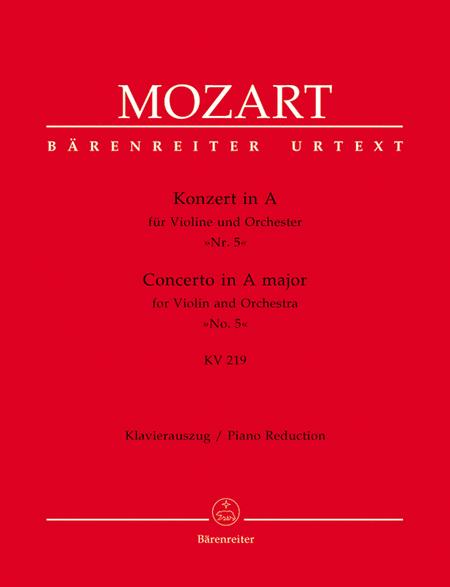 The new Urtext performing editions to Mozart's violin concertos nos. 1-5 contain new easy to play piano reductions. They offer in addition to the Urtext solo violin part, an extra violin part prepared with bowings and fingerings by M. Wulfhorst. 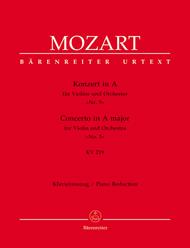 A brochure with cadenzas, lead-ins and fermata embellishments by Joseph Joachim, Sam Franko, Leopold Auer, Eugene Ysaye and Martin Wulfhorst is also included.